Alawa (the sleep howler) is a captive-born Canadian/Rocky Mountain gray wolf at the Wolf Conservation Center (WCC), a 501c3 non-profit organization, in South Salem, NY. All wolves travel in packs. Mother and father wolves are referred to as alphas. The alphas hunt for food for their young. They also choose den sites and territory for the pack. Wolves communicate with one another through howls and whistles. The theory that wolves howl at the full moon is based on the fact that wolves tend to howl more frequently when the dark nights are lighter due to extra moonlight. 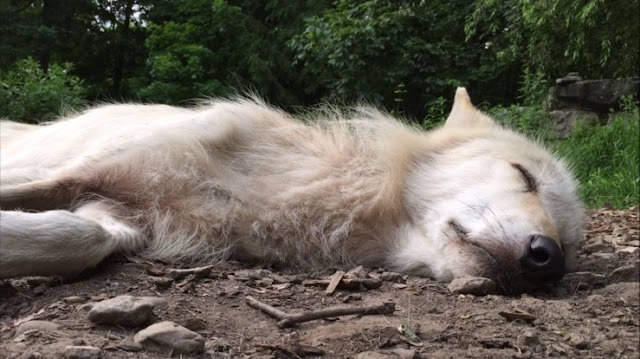 Responses to "Alawa, Gray Wolf Howling in Her Sleep at the Wolf Conservation Center "